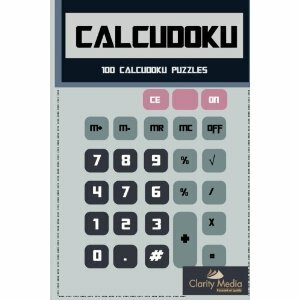 Welcome to this fantastic collection of 100 calcudoku puzzles. All the puzzles are 6x6 in size, and puzzles vary in difficulty. 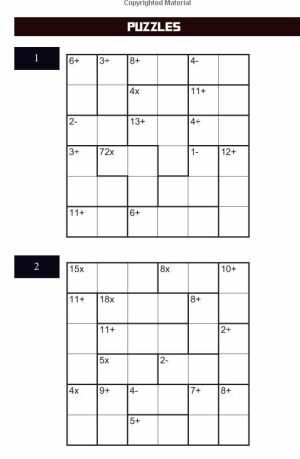 The rules of calcudoku are as follows: - Place the numbers from 1 - 6 exactly once in each row and column in the puzzle. - Bold-lined regions contain a sum. This might be a multiplication, division, subtraction or addition. The numbers in the bold-lined regions must be such as to make the sum valid. For instance, if the sum is '4+' and there are two cells in the bold-lined region, then the two numbers must sum to 4. - For division and subtraction sums, start with the largest number and then divide or subtract the other, smaller numbers from that as appropriate. For instance, in a region containing the numbers 3, 6 and 1 in any order, then if the symbol in that region is divide, then the total would be 2, because 6 divided by 3 divided by 1 is 2. Similarly for subtraction in this instance: 6 - 3 - 1 = 2. - Numbers are allowed to repeat within the bold-lined regions, as long as doing so doesn't break the rule that a number cannot repeat within a row or column. This means that bold-lined regions of two cells cannot contain repeat digits, since they of course are always contained within a single row or column. Let's look at the second puzzle shown to the right, and some ideas on where to start solving it. We know that the numbers 1 - 6 appear once in each region: let's use this to narrow down some options. You'll often find that pencilmarks are essential in solving calcudoku, particularly as you get started with your solve. Look at the first sum - it is 15x from three squares. So we know that between the numbers 1,2,3,4,5,6 then there is only one combination that will multiply together to create that total: it is 1 x 3 x 5. So we know straight away that the only numbers left for the rest of the row are 2,4,6. Now, the next sum in the first row is 8x: we know that must be 4x2. That means that the final number in the row must be 6, and since that 6 is part of a sum of two squares to 10, then the square beneath it must contain a 4. So, we can see that just by narrowing down the options for the sums we can very quickly make progress in solving calcudoku puzzles. It is really all about spending a little time at the start looking for sums that only have one option, then noting those down as pencilmarks: being able to exclude those numbers from any other cell in the region is a powerful strategy that quickly helps you reduce the options elsewhere and start making progress with your solve. A quick scan of the grid will usually help with the above: numbers ending in odd numbers can be useful for multiplications and divisions. Look at the fourth row: there is a 5x from two squares, so we know that must be the 1 and 5 in that row taken care of. That means that the '2-' that is alongside it can't contain either 1 or 5. The options there without knowing anything were 6 and 4, 5 and 3, 4 and 2, 3 and 1. Note how two of those options are removed now, leaving 6 and 4 OR 4 and 2. This tells us that the 4 for the row must be placed in one of these two squares, so it definitely can't appear anywhere else in the row: useful information particularly when solving some of the harder calcudoku puzzles. Just be careful to remember that where not all squares in a bold-lined region are in the same row or column that numbers can repeat, so your strategies from killer sudoku won't always work. Do you have any particular method or solving strategies you find useful when solving calcudoku? Let us know and we'd be pleased to add them to this page!